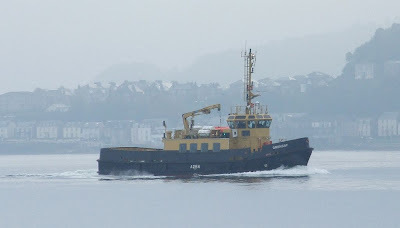 One of the fleet tenders operated from the Great Harbour by Serco Denholm on behalf of the MoD is this little ship, ORONSAY. A member of the Royal Maritime Auxiliary Service, ORONSAY was built in 2000 by the now-defunct McTay yard at Bromborough, on Merseyside. She is 199 gross tons, and 27.65 metres long. The 'O' class tenders, this one and her sisters OBAN and OMAGH, can carry up to 60 passengers.